I remember when I first started racing running events. 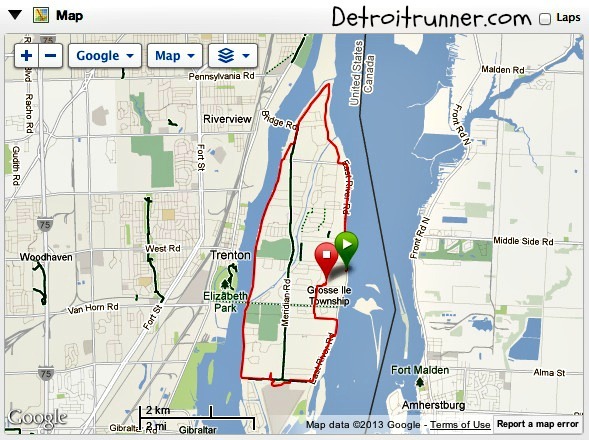 I did my first 5k in 2010 at the Corktown 5k. I was freaked out. I didn't know what to expect. I didn't want to be last. I didn't know anything about races but it was something I wanted to try. Maybe it would be something to help me continue to improve in regards to running? Well.....#41 races later with distances from 5k to the full marathon, I'm happy to say that I love racing. I. Love. It. Now I don't race as much as some of you but I do tend to get 10-15 races a year in. This year I have even more. Road races or trail races - they are all fun to me. And, of course, I've gotten over my fear of it. I can't imagine not racing and just running. I need that next race to keep me motivated. 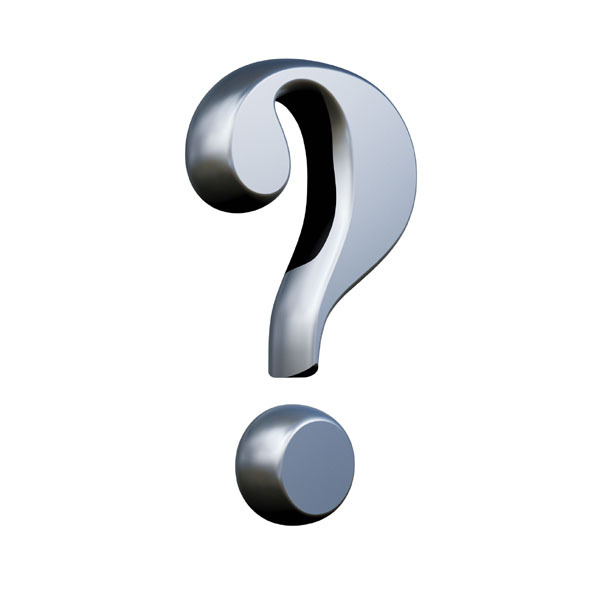 So, as some of you know, I have been contemplating something for a very long time(over a year actually). What you ask? The Triathlon. No, I'm not talking Ironman. Just a Sprint triathlon. But again I'm freaked out! More so than running! Seriously freaked out! What if I'm last? What if I can't do it? What if I don't finish? What if? What if? What if? What's my fear you ask? 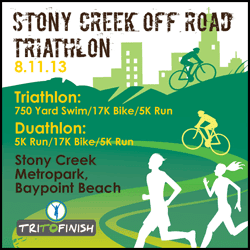 The swim....The bike.....The run - yes, even the run because all three are together. Of course, my real fear is the swim. Then my bike breaking down. Yes, I know how to swim but really I have no swimming experience except at our cottage in the summer up north. That's about the extent of it in the last five years and frankly I'll probably just wing it on the training for this. Even the bike, I've done some riding but really nothing more than 10 miles. The run I can handle, but can I handle it after the swim and the bike? It's time to face my fears. What's the worst that could happen? I don't finish? I come in last? 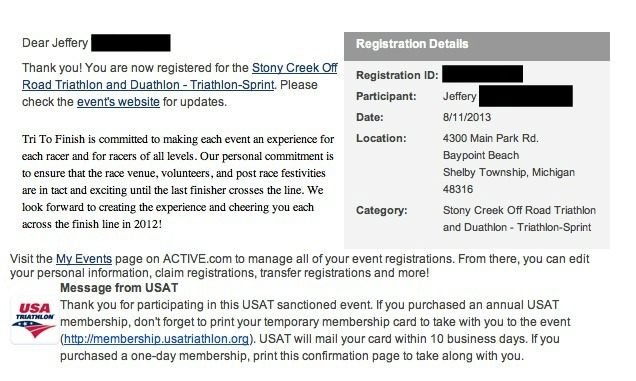 This year I WILL be a triathlete! What better way to start than a race on my training grounds? The race includes a t-shirt, medal and race photo! It's not a huge race and it looks like a fantastic race company. I'm excited and nervous at the same time! If you are interested in knowing more about their events in Michigan, go to their website, HERE, Facebook page, HERE or their Twitter page, HERE. If you are interested in joining me, prices go up on April 1, so hurry! 10 miles on the schedule this morning. Ran out at Paint Creek Trail. Ah, the trails are a wonderful thing. I love the trails. They are made for me. I must be on trails for the next 8 months on weekends. 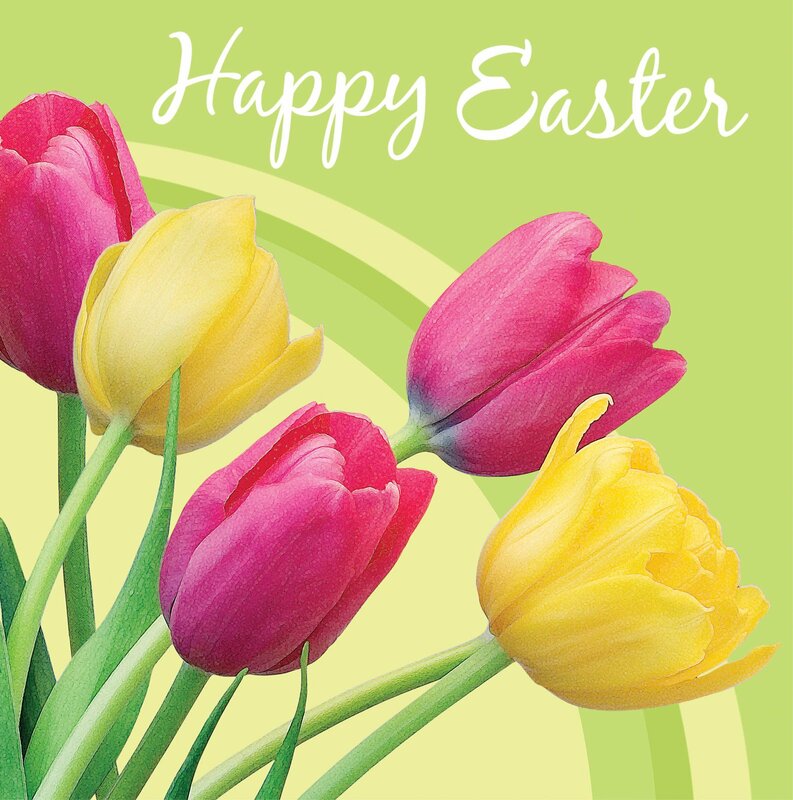 Have a great day and....Keep Running!!! 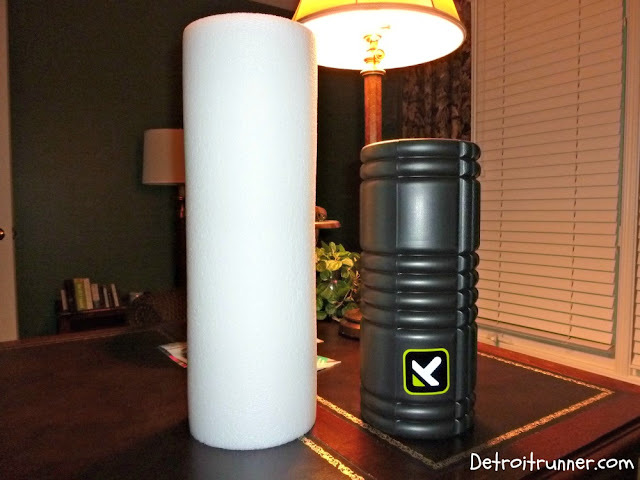 Another local blogger, Ty(see HERE) has been looking for information to help her with her IT band so I thought I'd put out a post about the foam roller. I've had IT Band issues and three things have worked for me: NOT RUNNING, stretching and the foam roller seemed to be what worked for me. I've often talked about the foam roller. It's one of my best friends. I use this handy device before/after every run and also before I go to bed. If I'm not running that day, I use it when I wake up and when I go to bed. It helps keep my legs in check. It's not a complete solution and really, if you are having severe pain, you should see a doctor or PT but if you are just trying to get the soreness out, I would recommend picking one up. It's keeps the muscles loose. Also, Runs for Cookies, shows you how to make your own if you are interested in doing that. Here's what I have used. I started off with the regular foam roller. It's great for beginners to get used to rolling and I say "get used to" because it can hurt at first and you can't put all your weight on the roller. But you will eventually be able to. I used the white one below for about a month or two and then it broke down. They just don't last. Enter The Grid. 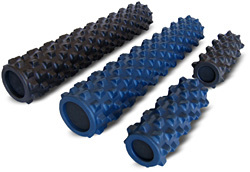 The Grid, made by TP Therapy, is a foam roller that has a hard tube with foam around it. The foam does not break down. I have used one for several years(3). It's got little grooves to simulate fingers, hands, elbows. It works for me. 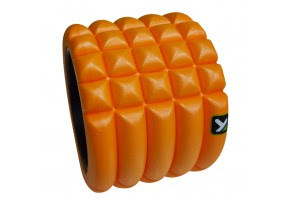 I've also regularly used the RumbleRoller although it's not something I could use on a daily basis. This monster is great for digging into the muscle. It really takes some getting used to, even for those that have been foam rolling for quite some time. This is the blue version but they even make a black version that harder(I can't imagine) It also does not break down and really gets into the hard to reach places that The Grid might not get into to. Also, the Grid is coming out in April with a new size(see the little one above) for use when traveling. I will be ordering this as soon as it comes in stock. I used to bring the mid size one vacation and this will help save room. For those of you that have not tried foam rolling, take it slow. You can't usually put the full weight of your body on the roller(especially these) until you get used to it. I use them so much I wish I could put more pressure than what I can put on it. It will typically hurt at first but keep doing it. 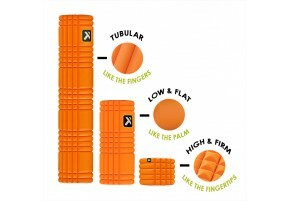 They work especially great after a marathon and you can feel the release from the muscle after a workout like that. 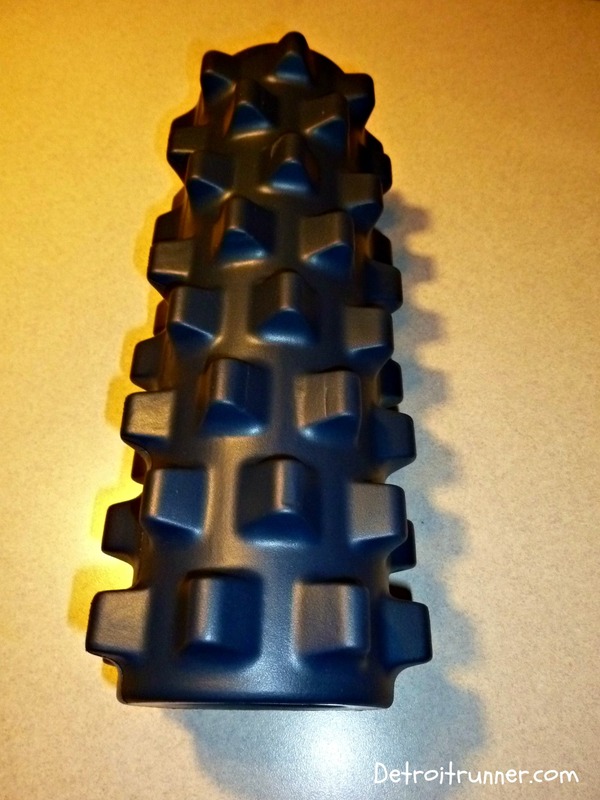 I now use these daily for a full body self massage whether I hurt for not and has made a big difference in how I feel. So, what's your advice for Ty? 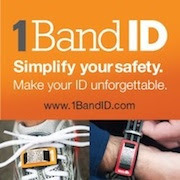 If you have had IT Band issues in the past or know of someone that has, what's worked for them or for you? 5 miles on the schedule. I ended up doing 5 miles. It was nice outside and perfect weather for running but I just wasn't feeling it this run. Probably the miles of the half marathon are starting to wear on me. Plus I was not feeling well on Tuesday. This is how today's run went. Mile 1 - oh, I should have take off today. Mile 2 - maybe I should just do 3 miles. Mile 3 - ok, starting to feel better. Mile 4 - yes, I can do one more. I'm feeling good! Mile 5 - done. Haha. Sometimes you just need to keep moving. This year I'm trying to show my love for the half marathon again. 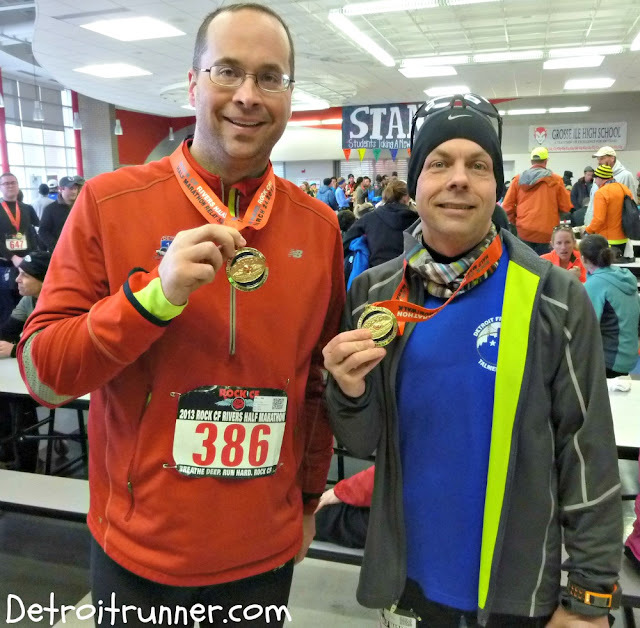 So far I've completed one half marathon - Rock CF in Grosse Ile(see review HERE). I currently have six more half marathons planned. All in Michigan but not all in the area. I'm venturing out into Lansing, Midland, Empire(near Traverse City) and even Dexter. Ok, Dexter isn't that far out of area but its probably out as far as Lansing from where I live. I know some of you have the goal of 13 in 13 and when the year started, I looked for 13 half marathons that were reasonably spread out but really couldn't find 13 that I really wanted to do or fit in my schedule. I'll have to settle for the 17 races I have on my schedule. Haha! Here's the rest of the half marathons that I'm planning for 2013. Lansing Half marathon. A new race for me! It's the second year for this race and its gotten decent reviews so I can't wait to see what it's like. It's my next half in 3.5 weeks. 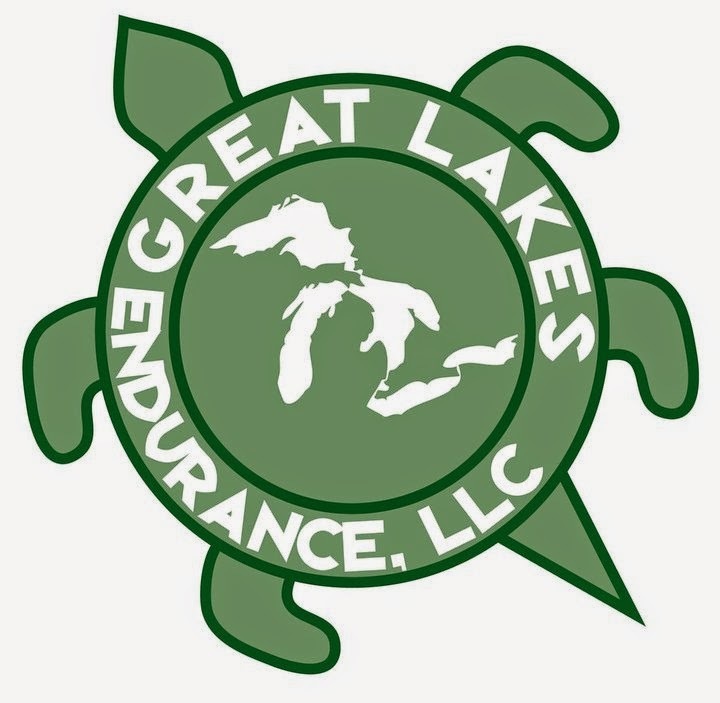 Great Lakes Bay Half Marathon. A new race for me! This one is in Midland. It's the old Qualifier race. It's changed. I know there were many that did not like the Qualifier but they have completely changed the courses(there's also a full). I'll be running the half as a race ambassador so join me! If you can't make it, I'll be sure to have a complete race review after the race. Dexter to Ann Arbor. Another new race for me! It's their 40th year this year so they plan to make it extra special. My only concern on this race is the heat. The course is a point to point which I've never done before but I've heard nothing but great things about this race. It's also my running buddy, T's, favorite race. He can't run it this year unfortunately. Brooksie Way Half Marathon. This will be my third time this year. 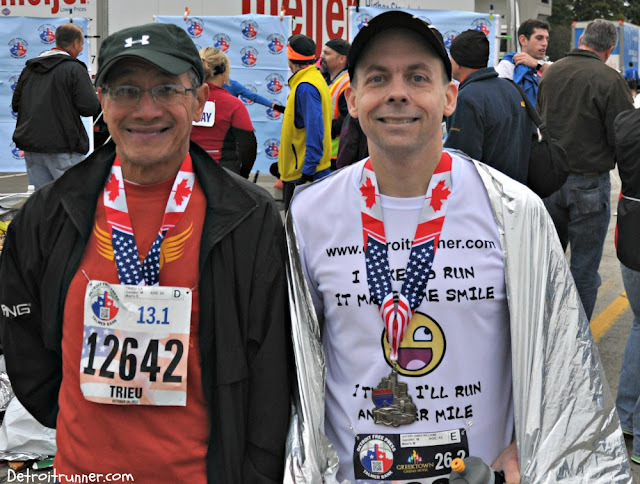 This race has a special place for me since it was my first half marathon. I love this very challenging and hilly course. It's a bonus that its close to home and the weather is usually perfect for it. I almost PR'd on this course last year but will not be trying for a new PR this year. Why? See next race. Sleeping Bear Dunes Half marathon. A new race for me! 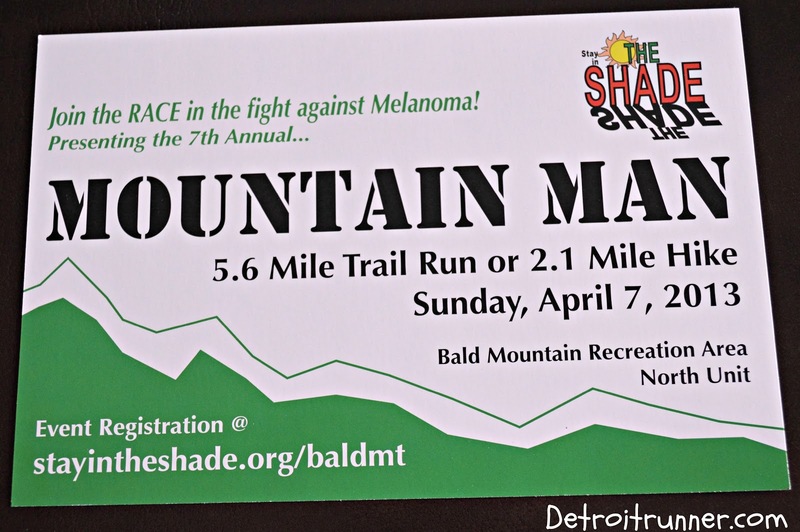 This is a very small race up in Empire near Traverse City. This is supposed to be a fairly hilly race but not terrible. Because I'm running this a week after The Brooksie Way(which is hard! ), I didn't want to try for the PR at Brooksie. We'll see how I feel for Brooksie and decide then though. This is supposed to be one of the most scenic areas in Northern Michigan. I've been to Traverse City but not near the dunes. 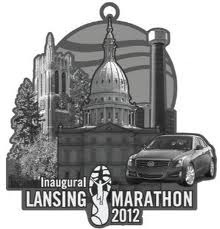 It should be a great race and will be nice to run a race where there are about 300 runners total. So that's it for the half marathon schedule this year unless something else pops up unexpected. Four new half marathons this year which is nice. I like to mix it up and try new races. If you'd like to see the other races I've got planned so far, click HERE. I'd actually love to run a half in December in Michigan but don't believe there are any in the area. Next Up! Coach Dion's kind of run! 6 miles on the schedule this morning. It was a perfect morning for it too. Nice outside and not freezing for once! I think spring might be around the corner. You know, after that big snowstorm we haven't had yet. This next recipe is completely awesome! I love this Chicken recipe and you will too. The chicken comes out moist and tasty! We don't typically eat it with pasta or sauce but you could. It's outstanding just as is. Preheat the oven to 450 degrees F. Lightly spray a rectangular baking sheet and slightly smaller cooling rack with vegetable oil spray. Put the rack on the baking sheet. Set aside. In a food processor or blender, process the bread into fine crumbs. Pour into a shallow bowl. 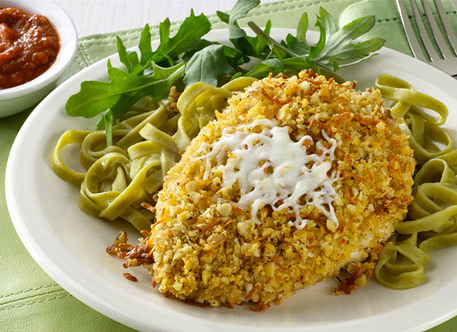 Stir the Parmesan, parsley, paprika, garlic powder, and thyme into the crumbs. Set the bowl with the buttermilk, the bowl with the crumbs, and the baking sheet and rack in a row, assembly-line fashion. Discard all the visible fat from the chicken. Dip the Chicken into the buttermilk, shaking off the excess liquid. Coat the crumbs, shaking off excess crumbs. Put the chicken on the rack. Lightly spray each breast with vegetable oil spray. Bake for 15 minutes. Turn over and bake for 10 minutes, or until no longer pink in the center. Finished in 1:55:27(official chip time); no PR by design. 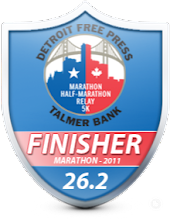 This was a great race with wonderful organization and the best finish line food I've ever had at a half marathon. Well organized, a great course, good weather, and nice finish on the high school track. The plan was to pace my running buddy Kevin to a new PR, which he achieved! Registration was very simple. Since I was one of their race ambassadors, I just e-mailed in my race registration and the race director, Emily, got me signed up. If I were registering, it would have been equally as simple since they use Hughesware for their registration process. I've always had great experience with this company for race registrations. The race also used them for volunteer sign ups as well. The race had two options to pick up your packet. You could go to their race expo on Saturday and pick up the day before or you could pick up that morning. Because I am about 1 1/4 hours from Grosse Ile, I opted to just pick up that morning. I'm really glad that they offer pickup that morning otherwise, it would be a deciding factor in doing the race. Fortunately, they offer both options. It was an extremely early start to the morning to get there. I was up at 4am in order to eat something and get over to my running buddies home so we could go together. Also, there are a couple logistics items that you have to be aware of with this race and the race director does an excellent job in communicating everything to you so there are no surprises. The first is that you have to pass over a railroad on the way onto Grosse Ile. Given that, you need to make sure you leave a little earlier in case a train stops you(it didn't for us). Second, this race is on an island - Grosse Ile. Because of that, you have to cross a bridge which could slow you down(again, it was not an issue). Third, if you want to park in the school parking lot, you must get there before 6:30am or they start directing runners to the airport for a shuttle(we arrived a little after 6am). As we walked into the school, there was a sign confirming all the start times. They also had an information book with someone answering any of the runners questions. Always a great idea. It's amazing what runners ask. If I'm not mistaken, the person sitting at the desk is Sandy. I volunteered with her at the Solstice(now Kona) run last year at packet pickup. Her and her husband volunteer hours of their time at these races. Incredible! The race was also selling Rock CF shirts, sweatshirts, stickers, hats, etc. with the race logo on them to raise more funds for Cystic Fibrosis. Fantastic and a great cause. As we made our way into the gym, this was our view below! Wow! We were pretty early but we(I) wanted to get into the school parking lot which was not an issue at all. We were able to go say hello to Ty from This is how Ty Runs since she was already there very early as well. In fact, you can see her in the picture below to the very left on the bleachers. Ha! The race had all the packet pick up tables and the registration tables all set up and volunteers were working away. Since there were very few people there, it was easy to get our packets and put them back into the car. I was amazed they had everything sorted by race which made it very simple but also required more volunteers. Since there were no shortage of volunteers, it worked great. I will say that all the volunteers I met this day were super friendly. It's clearly a hometown feeling race and the community of Gross Ile sure puts out the red carpet for us runners. The race also had the course map out as well for the runners. Check out that awesome course around the island. I could easily see a full marathon here. The race day packet pickup and registration areas were extremely well organized and could not have been any better. While we didn't take the shuttle, I didn't really see it as that big of an issue. The race offered race gear check(which is rare for a half marathon only) so you could check gear if you needed. It would be waiting for your after the race. 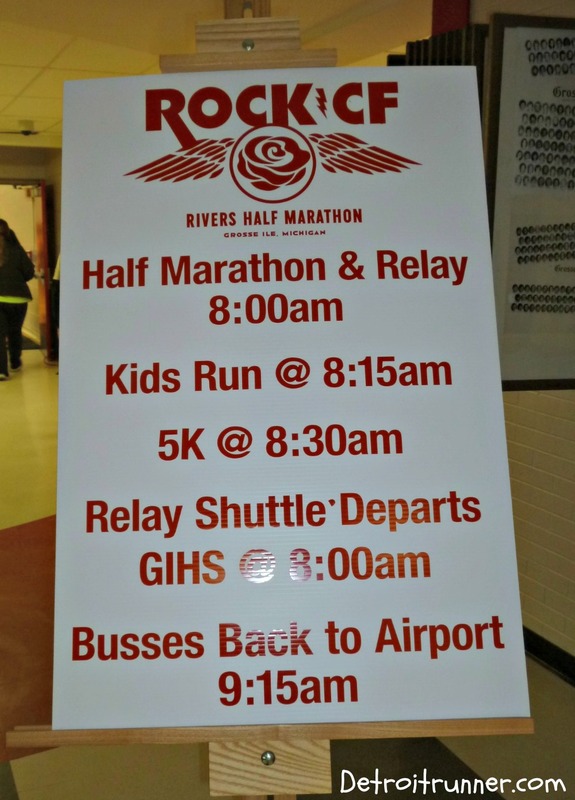 Probably the best thing about this area was that everything was located in the gym of the high school so the runners could remain in the gym and stay warm until about 10 minutes before the race. Given it can be a little chilly at the start, this is a big bonus for everyone. It gave us an opportunity to talk with other runners doing the race and meet up with a couple other local bloggers(Ty from This is how Ty runs; Stephanie from In Steph's Shoes and Josh from Clippin' Along) for a quick picture. Literally about 10 minutes before the race started, we made our way over to the start line area which was next door near the middle school. A gentleman recognized me who reads this blog so it was nice to meet him before we started the race so we talked on the way to the start. Aren't runners so friendly? The race had numerous port-o-potties at the start area(near the high school and the middle school) and also on the course as well. There were more on the course that I even think were necessary but better to be safe than sorry. Behind us at the start - lots of runners! After her quick speech, they announced the start, which was at exactly 8am and we were off!!! While it was a bit cold for the beginning first couple miles, I quickly warmed up and it ended up being a fantastic run. The wind came off the water a little bit but it really was not that windy. I think it could have been much worse and was pleased with the weather that day. 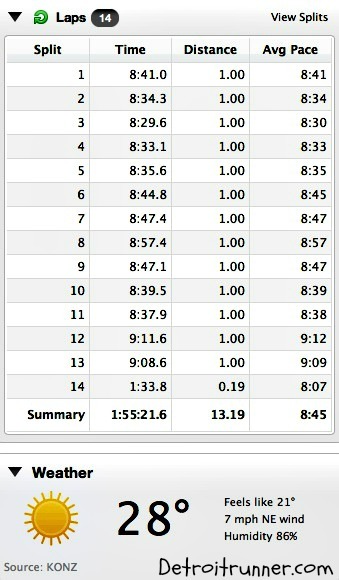 Here's my splits for the course and also the course map according to Garmin. Please note that the pictures I take on course are taken while running and I don't stop so they don't always come out great. I think I mastered the picture taking by the end of this race so they should be better in future races. I hope these pictures give you a good sense of what the course is like. This way, if you have not run this race, you get a better idea how it will be. Old homes on the island are everywhere mixed in with new ones. The china home - Ok, not sure what it's called but it looked like out of china. This was where the relay teams split off - it looked very organized and they were calling out race numbers. There were residences out and about around the course spectating but the spectators were minimal overall. It kind of felt like we were on a group run. Very enjoyable. I did notice quite a few potholes on the road near the first couple miles but they seemed to get better afterwards. This is the first time I've every run through an airport while at a race. It was a great addition to the race course and something very unique. I find it's difficult to find unique things on a course so I applaud the race staff for thinking of this great idea. There were clowns chasing cheering us on as we entered the airport. It was at this time that a race fan who was cheering on folks, yelled out, "Way to go, Detroit Runner" I actually got a picture of her below before she yelled it. If you are that person, thanks for the shout out and leave a comment here so I know who it was. Ha! As you got into it, there were planes - including a couple large ones I didn't get pictures of, and some smaller ones along with what I think was a green Lamborghini! You can slightly see it in the picture below. Back to the water view! Yeah! I love finish lines on the track. It feels so cool to be out on the track and hearing the race commotion to help bring you in for a faster time. The finish line on the high school track was a fantastic finish. I love the nice setup and the cool race theme layered on the fences to bring you in! The aid stations for the most part were high school kids volunteering. They did an awesome job cheering you at the station and calling out water and Gatorade as we ran by. They also had a gel product at one of the aid stations which I didn't try. They did a fantastic job at each aid station and were working good as a team to keep the area clean of cups. The finish area was quite organized with the inflatable finish line in addition to the nice signs on the fencing. It surely feels like a top notch race when you are coming into that finish area. Volunteers were there to give you your medal, the track was right next to the high school so it was easy to get back to the high school, and there were also bathrooms right at the finish as well. A great place for a finish. After we finished the race, we got a quick picture and then headed back to the high school for the post race food. This is the best part about this race! 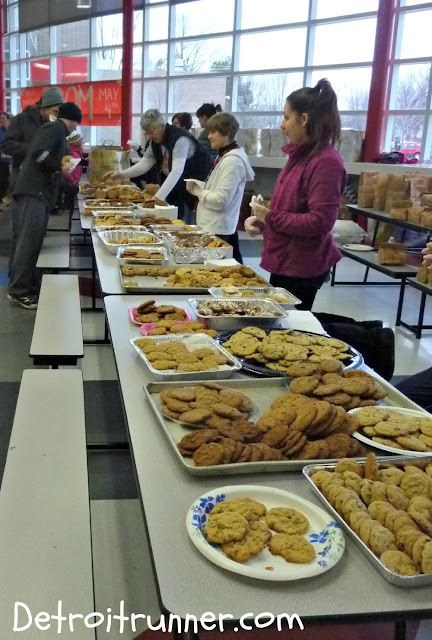 I have never in #41 races seen so many home made cookies for the runners and again the volunteers were excellent. The race had water and chocolate milk for us. They also had Panera Bread bagels as well as bananas. It's one of the few races where I probably gain weight after running 13.1 miles! Haha! (kidding) Superb! And it's all inside too so you can get out of the cold, take a seat and relax in the warmth after become all sweaty from running. I had some chocolate milk, a bagel and several cookies which were delicious! No way was I wasting calories on fruit today - I wanted those cookies! Ha! While we were talking with other runners, we were able to scan our race results from the QR code on the race bib to get immediate results. This is a great feature that every race should provide. Post race cookies! Look at all those. Amazing! With your race registration, you received a certified race course, course support including aid stations and police support to stop traffic. 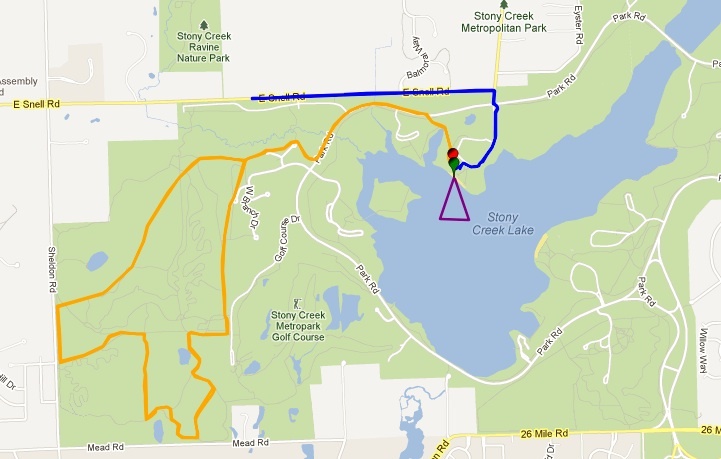 A timed course with QR coded bibs so you could get immediate results. You also received this cool sticker for Rock CF in your packet. 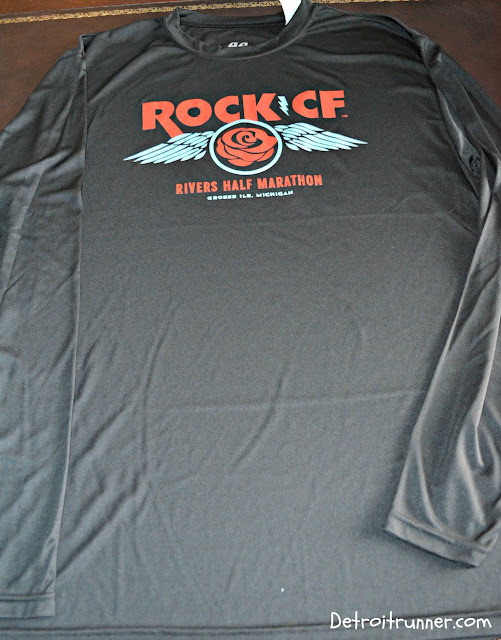 In addition, you received a long sleeve tech shirt with the race logo on it as well as a great medal. The medal is a nice design with a great looking ribbon as well. The race is very well organized. This started with the race communication which was outstanding. If you didn't know what was going on as a runner for this race, you were not reading all the e-mail updates that the race director sent. It kept us well informed. I saw volunteers running around like crazy that day to make sure everything was going well and, the race director Emily, was also running around to make sure everything was handled properly and that everything went off without a hitch. There seemed to be more than enough volunteers and they did an outstanding job and were so friendly. This is certainly on the tops for organization when it comes to racing for a half marathon. This was race #41(and half marathon #12) so I've had plenty of experience with other races. From the registration, communication, directions, maps, volunteers, course, police support, start line, finish line and the great food, they did an excellent job. On top of all this, it's for an excellent cause. This is certainly a race that you want to put on your schedule for next year. Given it's in the beginning of the season, it's fits into nearly everyone's race schedule and is a great half marathon to start off the season. Note: I received a complimentary race entry in exchange for this race review. All opinions on this review are my own and I was not required to give a positive review.